The Amethyst Shop is located in the centre of Luosto, address Luostontie 4, 99555 Luosto. 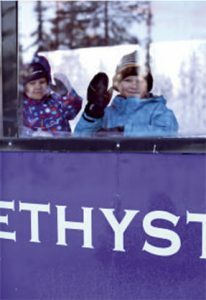 At the Amethyst Shop you will find authentic amethyst jewelry, polished and raw amethysts and much more, including souvenirs made in Lapland. From the Amethyst Shop you can get more information about the tours to the Amethyst Mine and during winter you can buy tickets to the tours there.